Published in 1852 – 56 by C. W. Mieling after drawings by Adrianus Johannes Bik. Adrianus Johannes Bik was born on 13 January 1790 as the son of an Amsterdam merchant, Jan Bik. He apparently received some training in art and was appointed draftsman to Professor C.G.C. Reinwardt on his scientific mission to Indonesia. He sailed with him from Holland on 29 October 1815 and reached Batavia on 27 April 1816, after spending some months at the Cape of Good Hope.Together with the Belgian painter, A.A.J. Payen, he accompanied Reinwardt on his various journeys of exploration in Java, and traveled with him in eastern Indonesia. On that voyage he visited Sumbawa, Adonara, Solor Timor, Ombai, Kisar, Bandanaira, Ambon and other islands where he made numerous topographical and natural history drawings, some of which are in the collections of the Rijksmuseum voor Volkenkunde, Leiden, the Tropenmuseum, Amsterdam, and the Rijksprentenkabinet, Amsterdam. Bik left Indonesia for the Netherlands at the end of 1846 and arrived there early in the following year. Among his possessions were put up for auction in Batavia were some paintings and a valuable collection of shells. 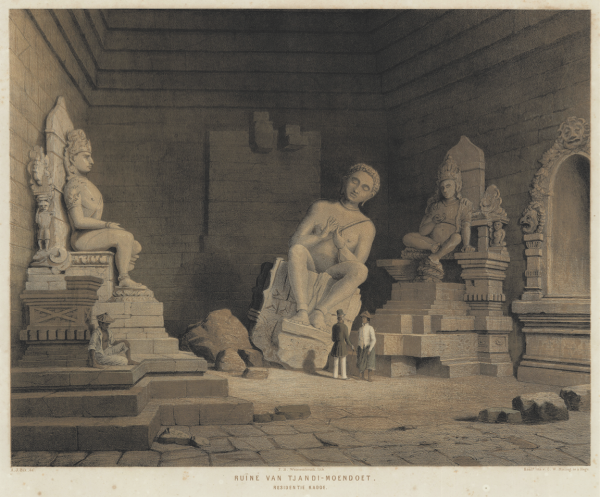 Bik’s own interest in antiquities is reflected in the four large lithograph plates of Artja Domas, Borobodur, and similiar subjects executed after his drawings by C. W. Mieling for the plate work, Javasche Oudheden ( The Hague 1852 – 56 ). The 1840s was an important period in the history of lithographic illustrations in Indonesia. In 1843 was the installation of a lithographic establishment at the Topographical Bureau of Engineers at Batavia. C. W. Mieling lithography establishment granted Royal predicate in 1847 – his Konincklijke Steendrukkerij was responsible for producing during the 1840s, 1850s and 1860s not only more topographical and ethnographical plates of Indonesia than any other establishment in the Netherlands, but also the most spectacular series of chromolithograph plates of Indonesian subjects ever published. Dimensions: 388 x 494 mm.